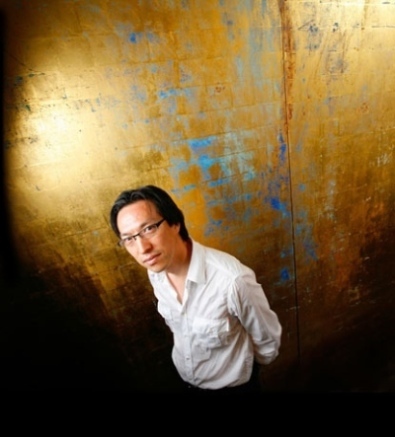 Makoto Fujimura in conversation at the Vancouver Art Gallery July 12. Photo by Duncan Ris. 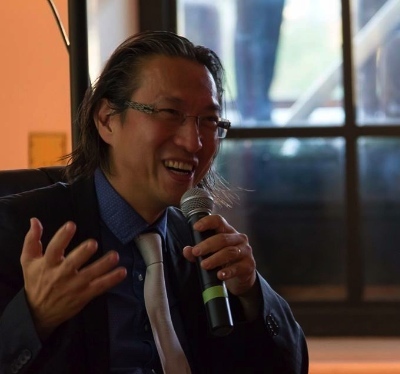 Makoto Fujimura is an artist, writer and speaker recognized worldwide as a cultural shaper. 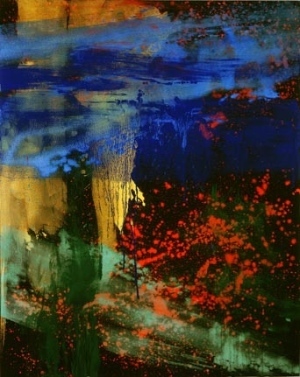 His style blends abstract expressionism with the traditional Japanese art of Nihonga; he founded the International Arts Movement in 1991. Following a very successful event sponsored by Image at the Vancouver Art Gallery earlier this month, Fujimura will be presenting a documentary on his Golden Sea project at Regent College next Monday (July 28). (See an excerpt from the film here.) He will then teach a one-week course, The Principles of Culture Care. In anticipation of his visit, Charlene Kwiatkowski asked him to respond to some questions. Charlene Kwiatkowski: You were an artist before you were a Christian. After your conversion, how did your faith inform your art? Makoto Fujimura: I felt even as a child that I was ‘called’ to art. What changed after my turning to Christ was to see that my own life was God’s artwork. My art has become a witness to this change in perception. I recount in my testimonial book, River Grace, how my faith guided me toward the art of seeing the world. As my faith in the invisible God grew, I was more able to trust what I perceived through my senses. RW: Are you now a ‘Christian’ artist or what do you think of this label? MF: I was always an artist, but realized that I was blind. Christ opened my eyes. I am an artist who has learned to truly ‘see’ in Christ. I do not consider myself a ‘Christian’ artist. The word ‘Christian’ should be used as a noun, not an adjective. CK: You started the International Arts Movement (IAM) to help other artists integrate art, faith and humanity. How important is it for artists to be connected to a creative faith community? For an artist who therefore lives by faith, he or she must journey toward a community of the faithful. Many artists (including myself) struggle with being part of a community. But artists need to see the art in the faith of brothers and sisters; brothers and sisters in Christ need to see faith in an artist. When I am able to do this, I find healing in my own journey. CK: I imagine you meet many artists in your role with IAM. What advice would you give to young artists embarking on their careers? ‘Success’ is simply being faithful to the calling you receive and to cultivate that calling. We must desire for each other in our communities and in our families what it means to be faithful to that call. CK: You had the rare opportunity of illustrating the Four Gospels for the 400th anniversary of the King James Bible. The Protestant church has long been suspicious of the arts, just as secular artists tend to view Christianity as anti-modern. How do you navigate this difficult terrain as a contemporary artist who’s also a Christian? MF: I simply try to be faithful to the slice of expression that I have been given. If the art expression is good, then it will create a cultural space of its own and silence the critics. If it is not authentic (or simply derivative), it will not have expansive power (what I call ‘generative power’) to elicit diverse responses to different people and lead toward healing the divide in culture. My expression comes out of an expression of love – my love toward materials and God. I do not think about much else when I am creating. The Crossway project of illuminating the Four Gospels was a humbling, exhausting experience. I actually began to paint the first few pages at Regent when I was teaching there several years ago. It was a harrowing journey at first, of tracing the tracks of illumination, tracks fading through time that are barely visible anymore. 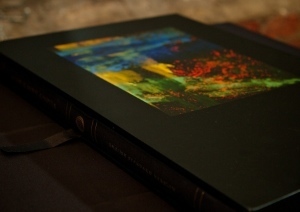 What I was able to do was to take baby steps toward a development of visual theology. In the public sphere, I am aware of the huge gap between the church and the art world, but I try to stay authentic to myself, to honour those around me and to be ambitious in love. I do not expect anyone around me to understand what I am trying to do. I simply live out my calling to the best of my abilities, and offer my art to the world as a path to glorify and to enjoy God. CK: Modern art often frustrates people because they don’t understand it. Claude Monet once said: “People discuss my art and pretend to understand as if it were necessary to understand, when it’s simply necessary to love.” What is the relationship between understanding and loving art? What are some good questions to ask when viewing contemporary art? Are there certain ideas you want people to ponder in your work, and what do you say to people who don’t see it? MF: A friend once told me – alluding to a quote by C.S. Lewis in An Experiment in Criticism – that in order to ‘understand’ something, you have to be willing to ‘stand under’ it. All art forms require that we invest some time learning the language of that art form. It’s not just modern art that people do not understand: most are not willing to stand under any work of art. We have learned to label and categorize something and call that ‘understanding.’ This is a result of a truncated view of education and lack of our culture to help all of us toward full thriving. Fundamentally, though, this labelling is a form of idolatry that we instinctively rely on (as in Romans 1) and is an unfortunate part of our human condition. We have taught ourselves not to see in our culture, so it may take a while for this conversation to go anywhere. Most children can see more than we can, and they do not have the preconception of what is art and what is not. But we teach them to not to see by the third grade. It’s really sad. CK: You have written extensively on beauty. In The Beautiful Tears you explore the “beautiful thing” (Mark 14:6) that Mary did for Jesus – pouring perfume on his body – and Judas’ critique of it, concluding that the opposite of beauty is not ugliness but legalism. What holds us back from embracing beauty? Why, like Mary’s act, is beauty necessary, and how do we reclaim its place in a world that often critiques, ignores, trivializes or perverts it? MF: The underlying ‘bottom line’ of our decision-making today, one that I believe is dehumanizing our culture, is what I call utilitarian pragmatism. When the arts are cut or marginalized, it’s not because of the budget – it’s because we see a human being’s value only in instrumental, utilitarian terms. We are created for gratuitous beauty. We are not machines. I am afraid that though we preach the gospel – the reality to which Mary responded so gratuitously – we do not fully embrace the extravagance of God. Mary of Bethany did, and elicited a great affirmation by Jesus himself. We do not love beauty because we do not fully understand the love of God. Beauty’s exile from our lives is a sign that we do not fully embrace nor understand (stand-under) the gospel. God is extravagant, pouring his gratuitous love into the world, embedding it into creation and into our souls. CK: So beauty is inseparable from God? MF: When I say God is beautiful, I am not using the word ‘beauty’ to define God; rather, I am saying that what we find beautiful flows out of God’s reality, God’s being. Beauty, therefore, is first a quality of being, and not an analytical definition. Definition flows out of the intuitive knowledge of beauty. Beauty defines us. All disciplines – from mathematics and sciences to art – flow out of our pursuit (and sometimes our denial) of beauty. Our rationality would not make sense if beauty, as a fundamental ontological reality, did not exist. CK: We often hear about being a good steward of creation in light of environmental discussions, but you talk about being a good steward of culture. What does this look like for Christians and the church today, and why is this discussion important? I realize that while this is a simple concept, it takes a great deal of time to unpack. I am hoping to begin that journey with my students together this summer. Charlene Kwiatkowski is a writer and editor in Regent College’s marketing and communications department, and the managing editor of The Regent World, in which this interview first appeared. Visit her art, literature and architecture blog.